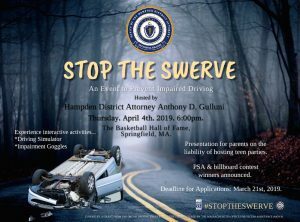 When:Thursday, April 4, 2098 Beginning at 6:00 p.m.
April 3, 2019 -Springfield- Hampden District Attorney Anthony D. Gulluni will be hosting Stop the Swerve: An Event to Prevent Impaired Driving at the Basketball Hall of Fame, this Thursday, April 4, 2018 at 6:00 p.m. The event is free of charge and is open to the public. Parents across Hampden County are encouraged to attend with their high school aged children attend as there will be a presentation to parents on the liability of hosting a teen party. This is of particular importance given the recent changes around laws concerning marijuana. Earlier this year area high school students had the opportunity to create public service announcements (PSAs) and billboards highlighting the dangers of impaired driving. The entries were to be original, note the risks associated with drunk or drugged driving, and communicate messages about public safety. The schools that submit a winning PSA and/or billboard entry will be announced and each receive a grant to improve technological equipment at their school. In addition to announcing the challenge winners, there will be interactive active events, such as: driving simulators, activities utilizing impairment goggles, as well as giveaways and other activities. A raffle featuring Apple Store gift cards, all high school students attending the event will be eligible. The event is made possible by a grant from the Drunk Driving Trust Fund which is administered by the Massachusetts Office of Victim Assistance.